The link is bringing up Episode 51. Thank you the episode and more so for the podcast, ideal work today. I was re-listening to episode 15-Justinian—( For all the new timers, please listen to episode one and up, they’re wonderful. Once you have, you’ll notice that it’s been going on for nearly two years, so if you dig this show, please: DONATE! Either by buying episode 28 or/and supporting this show’s link to audible.com. thank you)—and during the first half of that show, you said the line, ” Once Justinian’s education was complete”. That line stuck with me and is the basis for my question: How educated were romans of his day vs. the various members of the society during Heraclian dynasty? Vs. Pagan Rome? Or even the entire duration of Rome in the East? P.S. How would a Byzantine/Roman education affect a human being living today? Or sending our most educated back to them? Questiona for the end of the century podcasts: how did the Romans understand Islams relationship with Christianity? Was there any concept of an Abrahamic religious family, did they understand Islam’s connection to Christian religious tradition? Was Islam thought of as an offshoot of Christianity, or was it seen as a separate religion right from the get go? And on a sort of related note, you mentioned in this episode that the residents of Constantinople believed that the city was protected by God. Could you explore this concept in more detail? I know that there was a tradition that angel guided Constantine in setting the city’s boundaries – what are some other traditions about Constantinoples relationship with the divine? How has this show changed you (Mr. Robin Pierson)? A though formed as I was hearing you mention the magnitude of being 14 and running a highly complex and troubled state as you giving the introduction to Contans II, how would you be know as a ruler? As someone who’s viewed hundreds of year of statemans run amok, I wonder about the talents of the big shots like you, Mr. Pierson. A Question for the end of the century podcast. We’ve heard how long it took and how expensive it was to train soldiers for the army. When new recruits were required was there a central training area? or were the recruits trained at a local level and then sent off to the commander of the Theme? Something that has always struck me is the difference between the finely detailed portraits on the coins of the late Republic and early to mid empire, and the far less detailed ones of the Byzantine era. Is this trend due to a decline in the ability to produce finely detailed coins, or simply a further progression of the stylization of imperial portraiture that had started during the third century? In other words, did it reflect a decline in material culture, or simply an artistic choice? By the way, I love this podcast. 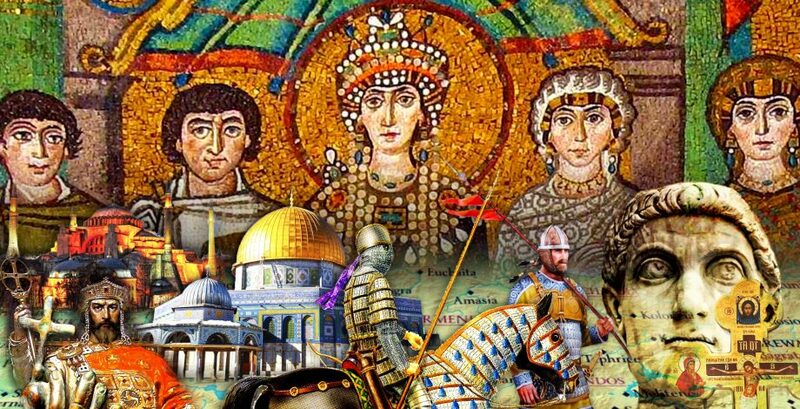 I have had an abiding love of Byzantine history since I first delved into it during college. I read more than is likely healthy, and I even used a story from Byzantine history as the introduction to my PhD candidacy exam presentation in graduate school. (My work dealt with the role of historical contingency in evolution, and Byzantine history is a rich source of examples of where history’s course was contingent upon seemingly chance, minor events.) This podcast has been like a dream come true, and is more than a worthy successor to Mike Duncan’s History of Rome podcast. You have my immense gratitude for all your hard work in putting the podcast together. Hi Robin, congratulations on your webcast I really like it and I like your goal to be as accurate as you can be. In that regard please note that while talking about emperor Constans II movements Italy you said that Calabria is the “heel” of the Italian peninsula. Actually that would have been Puglia. If you wanted to stay on the Italian “boot” analogy you should have referred to Calabria as the “toe” of the Italian peninsula. Thanks and keep up the good work. As I explained on the podcast (and you can read here http://en.wikipedia.org/wiki/Calabria) the place name changed during Byzantine times. Thanks Robin, you are right the name changed during the VI century before Constans II went to Italy (you can read it here if you can read Italian http://it.m.wikipedia.org/wiki/Ducato_di_Calabria#Premesse_e_nascita_del_ducato) and I look forward to hearing more about the creation of the Theme of Calabria in your future podcasts. Keep up the good work.